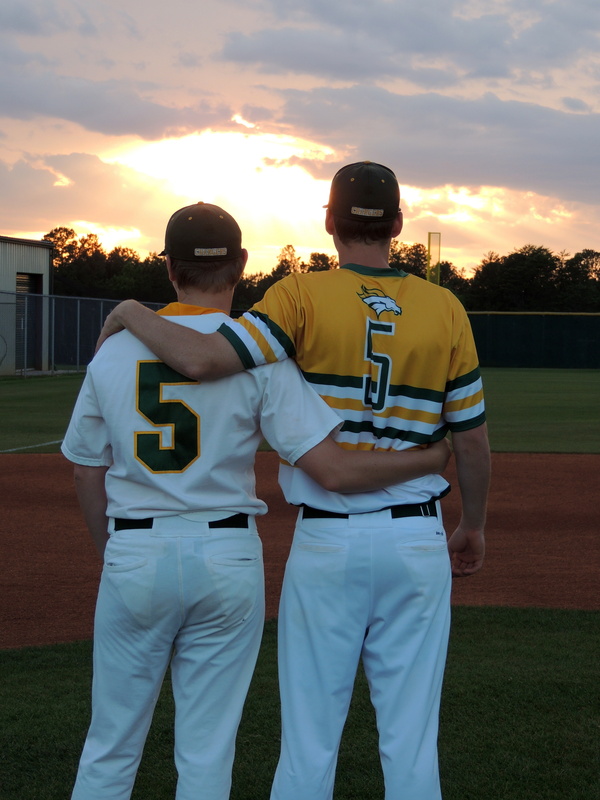 The 2014-15 high school baseball season is over. The season of older brother-senior-high school-baseball player Chase being in the dug out and on the field with younger brother JV not-yet-starter-freshman-player Tanner is over. So is the season of brothers going to school together. It is so sad to see this season end because the older brother has not only encouraged the younger brother, but has also encouraged those around him who were quietly watching the interactions on the sidelines. Confidence grows with faith and encouragement, and the tall number 5 made sure that he helped encourage the shorter number 5, and the shorter number five is not only growing taller, but standing taller with confidence. Amazing the difference a person can make. The younger number five even said to me this morning, “I want to do something for Chase before he goes to school because he has done so much for me. I’m really going to miss him.” And the mom of both number fives gulped hard and said that I knew and that I’m really going to miss him, too. Between seasonal allergies and the sweet and sour moments of life just happening, I think there will never be enough Kleenex in my home. But thankfully, with all of the changes, some things will always remain “in-season”. Brothers are brothers, period. No one can take the moments and memories of what they’ve shared from them. There’s a season for everything, and maybe the younger brother will benefit from this new season of learning to stand alone, not in the shadow of the older brother. I’ll look for the silver linings during this season of transitions, this season of change. I’ll be thankful for what’s been and hopeful for what’s to come, and keep the Kleenex close at hand. I’ll pray through and ask God to be the constant constant Presence in our lives no matter what changes may come. That faith? That will help me to stay on my knees in my heart and stand tall with confidence through the changes knowing that come what may, God knows, and is, and loves, and gives in every single season we face. “Nevertheless, I am continually with you; you hold my right hand.